Butter cream frosting is fantastic for piping designs and messages on cakes. But when I'm in a hurry, or short on powdered sugar and butter, 7-minute frosting is my choice. I practically always have the ingredients for 7-minute frosting -- granulated sugar, egg whites, vanilla, and either corn syrup, cream of tartar, vinegar or lemon juice (these ingredients allow the egg whites to beat up nice and fluffy). Bonus, these ingredients are very economical, too! One batch of 7-minute frosting cost me about 35 cents. The same amount of butter cream frosting would have cost me about $1.75. Today is my son's birthday, although we celebrated on Saturday. I had baked the layers on Friday and wrapped them in plastic. Then late Saturday afternoon, one of my daughters helped me make the 7-minute frosting, and place the M&Ms (leftovers from Hallowe'en) on top. The whole frosting/decorating took about 15 minutes, which is really pretty fast, for me. Some years, my cakes look almost professional. Other years, colorful and cheerful are words that best describe my cakes. What matters most, I think, is that the cake tastes delicious, and everyone enjoys the celebration. One of my son's gifts was inspired from comments by Katie @ Life lived intentionally, on an earlier blog post about gifts on a small budget -- the car repair/emergency kit. With winter on the horizon, a winter car emergency kit seemed appropriate for my son's birthday. The total cost for this "kit" was under $20. In the basket, I put a bag of kitty litter (for traction when stuck in the snow), a snow and ice scraper, a road-side triangle reflector, a flashlight (with batteries), an emergency rations food bar, and an emergency blanket. 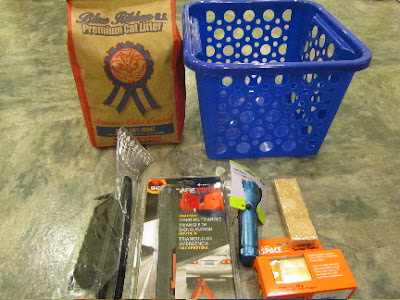 I found the basket, flashlight, batteries, kitty litter, and snow/ice scraper at Dollar Tree. Finding so many items for just a dollar each was a great help to my budget. 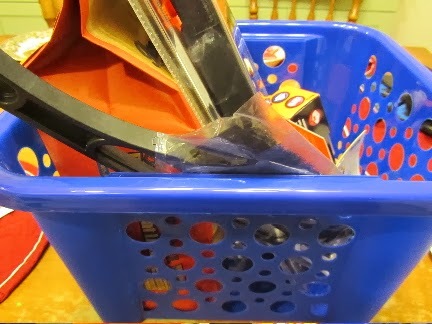 Anyway, my son put the whole basket in the back of his car right away, and seemed very appreciative of the gift. For the rest of the celebration, the 5 of us went out for Chinese food, then came home for cake and gifts. It was a fun evening, and I think the birthday guy had a great time! Mmm, yummy cake. Averiecooks.com has a recipe for cookies with sprinkles mixed in the batter--I tried it, it's yummy, and I think it will make a fun school treat for my son's birthday. I really hate messing with frosting--I'm "frosting impaired"--so I like alternatives. Having said that about frosting ... for years I've made the kid's birthday cakes myself instead of buying them (well, ok, I use a cake mix cuz it seems to turn out better and since I have the afore-mentioned frosting impairment, I do admit to buying canned frosting!). My mom gave me a book on cut-and-decorate your own cakes which I have used extensively, as well as finding ideas online. I made frog cupcakes for school for my daughter's birthday earlier this month and a frog cake that I found at coolest-birthday-cakes.com. It's fun and even without doing it completely from scratch, it's still substantially cheaper than purchasing ready-made items. I love the emergency car kit idea. I'll have to file that idea away for when my kids are older. My husband made up a toolbox kit for my son's 10th birthday this year (complete with a saw, wood, and simple wood projects he printed off from online sources) and it was a big hit. We don't have video games at our house so I love finding "big boy" ideas. 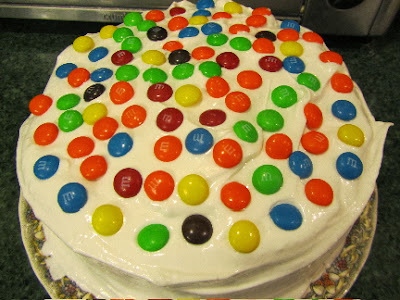 You know, my mom always insisted on making a boxed-mix cake. She preferred the texture and said they were more reliable. I've had my share of scratch cakes that sink in the center. I now add just a bit more flour (2 extra tablespoons for a 2 layer cake), and my cakes don't sink in the middle any more. Your frog cake sounds adorable. Those cut and shape cakes can be really, really cute! And your cookies for your son's birthday sound very cute. As for saving money with mixes -- I know a few women who coupon and watch for sales, and make their kids' cakes for practically nothing, so it can be cheaper, than scratch, and most definitely cheaper than a bakery cake! The wood-working kit sounds like it was a huge hit. Kids like to make things, and getting grown-up tools is always a plus with them. I remember the year my daughters received a kit of kid-size cleaning tools. They absolutely loved mopping the kitchen floor! It took them an hour or more, but they got the job done, and they were immensely entertained -- it was play to them. That was so fun to come here and see the idea!! I'm glad that worked out. I absolutely love the Dollar Tree. I'll have to look there when I finish up the one I'm making. A very Happy Birthday to your son! Your cake looks yummy! Thanks for the idea! My son really appreciated this gift. My grandma used to make cakes iced in 7-minute frosting with sprinkles on top. It always brings back fond memories. What an excelent gift for a young driver. This is a great reminder to me: time to put my winter supplies in the van. I'm weary of the quality/duribility of Dollar Store merchandise. I think I'd feel better about higher quality products in an emergancy kit. I would have purchased the flash light, batteries & ice scraper somewhere else. I'm making 3-minute frosting this afternoon (half batch for cupcakes). This sort of frosting must have been widely used in the 50s, 60s and 70s. Thanks for the birthday wishes for my son -- I'll convey them to him! Dollar store stuff can be hit or miss. I'll usually ask myself, "would I buy this at another store?" I return stuff that I have problems with, but my one pet peeve with Dollar Tree, is they won't refund the money, but only exchange the item. Otherwise, I've been pretty satisfied with them. A YMMV sort of thing. Happy Birthday to your son, Lili. Even though you don't talk as much about him as the girls, I think about him, because he is the same age as one of my kids. We have given car kits to both of my sons for Christmas gifts before and I don't think there is a better gift. Thanks for the birthday wishes for my son -- I'll convey them. I think I just give him more privacy than my daughters, as he seems to prefer it that way. I knew your sons were around the same age, one has moved out, but the other is still at home, right? We moved Wally out last weekend and this weekend coming up, we are helping Theo move to a different apartment. Then nest is empty! Some day I will post about it, but I try to give them privacy on most things except being a carnivore. I can't quite imagine what it will feel like to have an empty nest. A new stage in life for you and Ward. Yes, someday, do post about what your life is like with an empty nest. I'd find that very interesting, as I keep wondering how my life will feel when it's just my husband and I here. OK... now I'm totally craving cake with loads of yummy frosting... it looks sooooo good! I'm not sure if I've ever actually baked a cake... I tend to go for things like shortbread cookies (CatMan's favorite) or brownies (my favorite). Hmmmm... perhaps I'll have to commune with my oven this evening! and did you commune with your oven and bake cake or cupcakes? I go through phases where I want nothing but cake, then later, nothing but pie, then cookies, etc. I'm an equal opportunity bakery lover. I made this frosting (thanks to this blog post) on wednesday for my son's birthday cake and it worked really well, everyone loved it and it was much cheaper than butter icing and, I figure, less fat? happy birthday to your son! I love this frosting. Another good thing about it, as there's no confectioner's sugar (powdered sugar), no added corn starch. My bag of powdered sugar lists corn starch as the second ingredient, and I'm still trying to limit how much corn product I consume. I'm glad the frosting worked for you! Put a small candle, a can and matches in the winter emergency kit. It will keep u from freezing.. Interesting. . .are you meaning to use a candle within a can as a portable heater? I have been thinking of adding a couple of those heat packs, that you can put in pockets or boots to keep warm for several hours.